The first snow of the year fell at the end of November and this was followed by more in December which was accompanied by very low temperatures. These two things combined put paid to many planned events in addition to temporarily halting the ongoing construction projects at Littlecombe and May Lane. The snow stayed on the ground until 27th December after which rain during the night and rising temperatures cleared it away. 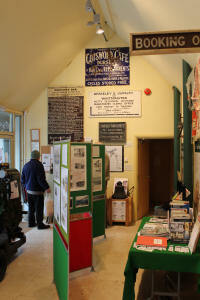 This month also saw the end of the successful Severn Railway Bridge exhibition at the Heritage Centre after which it was closed for redecoration. It's expected to be open again in February although someone will be in attendance on Saturdays during January to sell copies of the new Dursley Lantern 2010. Very low temperatures resulted in a heavy frost on all the trees as well as the ground. A week on and further falls of snow and falling temperatures helped to maintain the wintry appearance of the town. The continuous snowfall produced a very wintry scene on the town's recreation ground. The Parish Centre and grave yard of St. James' covered in snow. The old Toll House Cafe, now used as a cycle shop, succumbs to the snow. The Heritage Centre has been running a very successful exhibition on the old Severn Railway Bridge but this came to a close during December.